The TS 800 Cut-off Machine now featuring a magnesium guard and reduced weight. 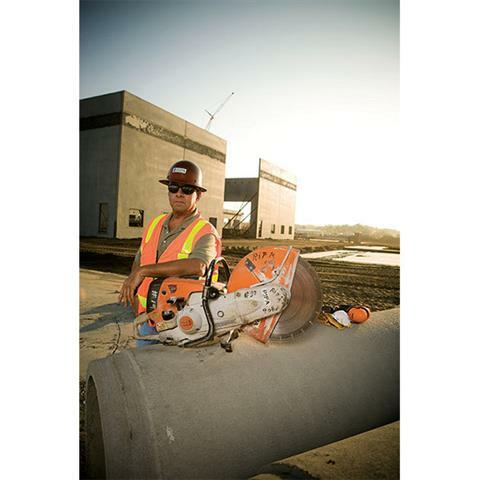 The TS 800 STIHL Cutquik® cut-off machine features a magnesium guard making the machine a full 0.7 pounds lighter than the previous model. 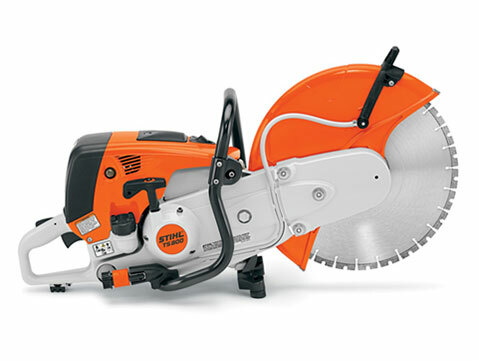 The TS 800 features a 16” cutting wheel, the largest size we offer in a handheld design. When used with the optional STIHL Cutquik® Cart, the TS 800 is an excellent alternative to conventional walk behinds because it can be used as a handheld or quickly snapped into our cart for long, straight, controlled cuts. It’s also fuel efficient, with enough power to cut through asphalt, concrete, rebar, iron and steel with ease. SEMI-AUTOMATIC BELT TENSIONING: With consistent, semi-automatic re-tensioning, this feature increases the service life of the belts and shaft bearings. REPLACEABLE "IN TANK" FUEL FILTER: Lowers cost and is easy to maintain. HEAVY-DUTY AIR FILTRATION SYSTEM: The TS 410, TS 420, TS500i, TS 700 and TS 800 feature the X2. The X2 air filter system uses centrifugal force to separate large dirt particles before they come in contact with the air filter. STRATEGICALLY PLACED AIR INTAKE: Rear placements helps filter stay cleaner longer. BAYONET-STYLE FUEL CAP: With retainer for easy use, even with gloves on. UPRIGHT AND ENLARGED FUEL PORT: For easy fueling. ON/OFF SWITCH: Conveniently located on top of handle and recessed to prevent accidental shutdown. SPARK PLUG: Protected yet easy to change. HIGH-TECH POLYMER HOUSINGS: Lightweight and corrosion-resistant. HIGH-PERFORMANCE COOLING SYSTEM: For superior air flow and heat dissipation. PROTECTED DECOMPRESSION VALVE: Makes starting easier. 2-RING PISTONS: Improve engine efficiency and holds compression longer than 1-ring pistons. Also, 2-ring Pistons transfer heat from the piston to cylinder better, helping engine stay cooler and last longer. LONG-LIFE CYLINDERS: Provide optimal cooling, lubrication and more power output per cubic centimeter of engine displacement for maximum wear life. SPARK ARRESTOR MUFFLER: Has large baffles which reduce noise level, and contains a screen designed to reduce the emission of sparks. INTERGRATED WATER SUPPLY HOSE: Helps prevent hose damage. SEMI-AUTOMATIC BELT TENSIONER: Allows for easy adjustment of drive belt. 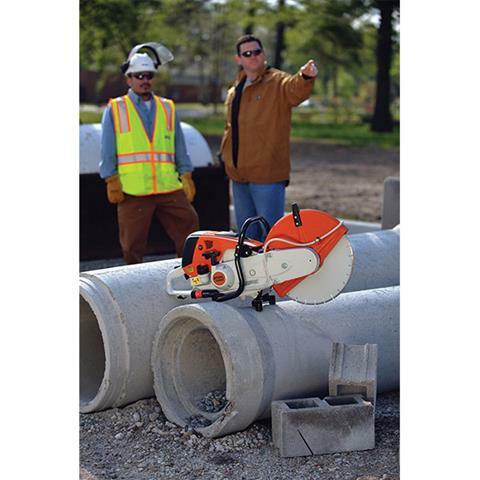 REVERSIBLE CUTTING ARM: Lets you cut in the inboard or outboard position. WATER KIT: Reduces dust when cutting concrete when attached to a water supply. ELECTRONIC IGNITION: Provides easy starting and smooth running. BALANCE AND DESIGN: Helps reduce fatigue and makes handling easy. INTELLICARB™ COMPENSATING CARBURETOR: Measures air on clean side of air filter and adjusts metering diaphragm in carburetor, maintaining optimal fuel-to-air ratio. Keeps RPM levels even when the air filter begins to clog. ELECTRONIC WATER CONTROL: Allows operator to easily adjust the flow of water while cutting and stops the water flow when the machine is at idle. ANTI-VIBRATION SYSTEM: Helps to reduce operator fatigue.